Systematic field investigation and documentation activities. Background research on written documents, images and in-person interviews. The use of cutting-edge technology. Pro-active public outreach and education programs designed for audiences fo all ages. The Maritime Preservation and Archaeology initiative at the Wisconsin Historical Society was created in January of 1988 in response to the passage of the U. S. Abandoned Shipwreck Act of 1987. This act gave the state the responsibility to manage abandoned historic shipwrecks in state waters. The Program became an active research unit of the State Archaeology Program. The Maritime Trails initiative encourages divers, snorkelers, boaters, maritime enthusiasts and tourists to visit and enjoy Wisconsin's diverse collection of maritime resources. A collaborative effort between the Wisconsin Historical Society and the University of Wisconsin-Madison Sea Grant Institute, the Maritime Trails initiative seeks to document, preserve and protect the state's submerged archaeological sites. Explore "Wisconsin's Great Lakes Shipwrecks," a collaborative online exhibit featuring 13 shipwrecks in Lakes Superior and Michigan. The Maritime Preservation and Archaeology program works for the long term preservation of these shared non-renewable resources by maintaining careful field documentation. This information is made available to the public through publications, the Maritime Trails website, the Wisconsin's Great Lakes Shipwrecks website and public presentations. The field documentation information is also used to list the sites on the State and National Registers of Historic Places. This adds an additional layer of protection for the sites. 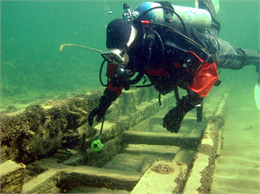 As stewards of these unique historical and recreational resources, the Wisconsin Historical Society staff encourages responsible diver visitation to the fragile underwater sites. Wisconsin law prohibits unauthorized disturbance or removal of artifacts, structure, cargo or human remains. To report damage or artifact removal from Wisconsin’s shipwrecks call 1-800-TIP-WDNR.